A significant innovation of RECOLAND is the formulation of the theory on institutional credibility, and on its foundations, a methodology for decision-making in development, with particular reference to urban and regional planning, agrarian change, resource and environmental management, and structural readjustment policies. Credibility theory predicts that when institutions persist in time and space they are functional, thus credible. If not, they would have changed or gone extinct. This principle holds regardless the form of institutions – private/public, formal/informal, and secure/insecure – and implies the necessity for caution and restraint when considering the design and establishment of new institutions. The immediate relevance of the theory for the understanding of policy is its refocusing from institutional form towards function, and its methodology that helps identifying the policy options in accordance with the role that institutions perform in a time and space-dependent environment. This is particularly important in a poor, developing context, where land plays a crucial role in the provision of social welfare and security. Actors’ perceptions of institutions, which can be operationalized through the FAT Framework. 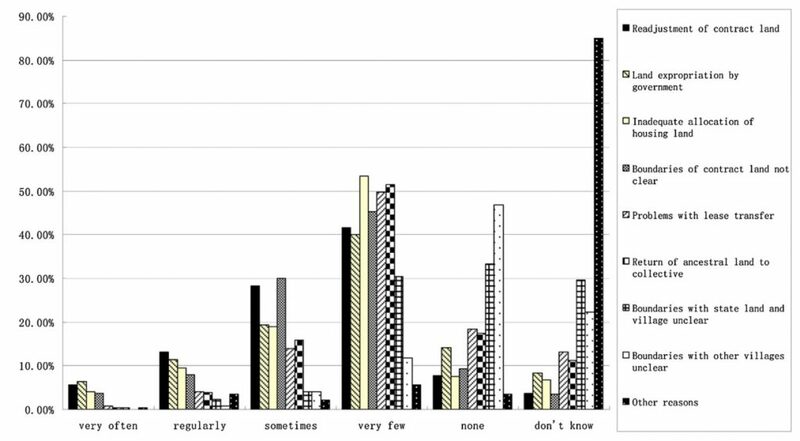 Hypothesis: the larger the divergence between actors’ perceptions of “institutions-in-use” versus “institutions-desired”, the lower the credibility. 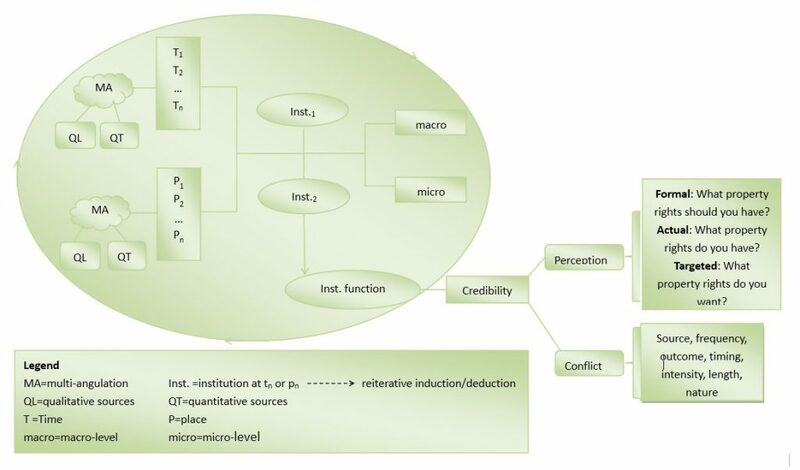 Actors’ perceptions of conflict, which can be operationalized through Conflict Analysis as measured through indictators including origin, frequency, nature, length, outcome, intensity, and timing. Hypothesis: the higher the level of perceived conflict, the lower the credibility. An example of its application can be found in Ho (2014). Speed of institutional change, which can be operationalized through an “Institutional Archaeology”, the meticulous description of institutions over time. An institutional archaeology over time makes use of “multi-angulation” of different sources, qualitative and quantitative; socio-economic, legal-political, and cultural. This can be depicted in (add attached Figure multi-angulation). Hypothesis: the higher the relative speed of institutional change, the lower the credibility. This can be operationalized through the CSI-Checklist (Credibility Scales and Intervention Checklist). After the current levels of credibility have been assessed, the CSI Checklist may allow decision-makers to pinpoint available policy options. As credibility is not to be seen as a dichotomous variable, but positioned on a continuum, these policy options can constitute a mix including: non-intervention, co-optation, facilitation, prohibition and ordaining. For instance, when the credibility of institutions and property rights of informal settlements is perceived as high by social actors on the ground, the best policy option would be “non-intervention”. Likewise, when moving down on the credibility scale, one could also consider co-optation, or “formalizing that what is already done”. For more information, see the introduction by Ho (2016). Currently the book “An Endogenous Theory of Property Rights” (edited by Peter Ho) is in the make. For further reading see the website of Routledge.